Happy Sunday again Dear Readers! The weeks just fly by, don't they? Here we are at another Sunday, after a busy week. 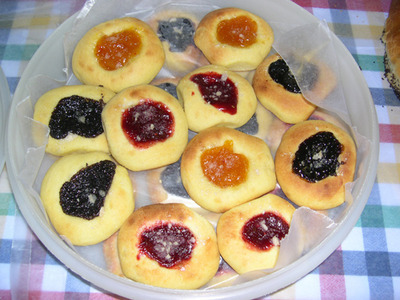 I also made kolaches on Thursday, & was planning to take those to the class too. This photo is from last July, but the method is the same. Make a Very soft dough, let raise, shape, let raise, fill and let raise a final time, then bake. As you can see I use Solo brand filling. I just wish our local stores carried the red berry varieties. Sieving the seeds out of raspberry pie filling is a pain. Heat the milk, add butter & shortening and cool to lukewarm. Beat egg yolks & egg. Add sugar and beat until thick. Add salt. Dissolve yeast & 1 tsp. sugar in 1/2c. warm water. Add milk mixture to egg mixture, then add yeast mixture and beat until well combined. Form dough in to balls about the size of a ping-pong ball. Let rise until almost doubled. Use your two first fingers to make a depression in the center of each dough ball and fill with about 1 tsp of Solo filling. Let rise again. Bake at 425 degrees until light golden brown. Cool on parchment paper. NOTE on dough-- You will think you made it wrong. The dough is VERY soft, almost like too-thick batter. I flour the counter top when I turn it out of the bowl before I form the balls. 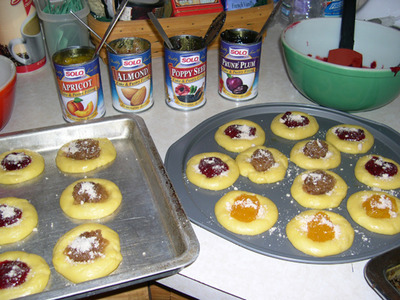 It's a bit messy but don't add too much flour to dough or the kolaches will be dry. Here is a container all ready to share with friends. Have a wonderful week, everyone! I'll be back soon. – "A hundred men may make an encampment, but it takes a woman to make a home."